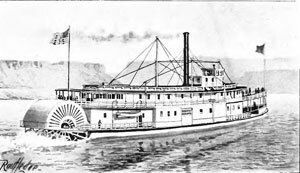 The Daisy Ainsworth (named after Captain Ainsworth‘s youngest daughter), was launched by the Oregon Steam Navigation Company at The Dalles on April 23, 1873. She was two hundred and four feet long, twenty eight feet wide, with paddle wheels twenty one feet in diameter – the finest steamer of its era in the region. She ably worked the river from the Cascades to Astoria until the early mornings hours of November 22, 1876, when she struck a sunken reef or rock a very short distance above the upper landing at the Cascades and sank (The Oregonian, 23-November-1876).